In a marvelously insightful and entertaining piece published on his Nonprofit With Balls blog, executive director Vu Le calls out non-profit leaders and organizations who are constantly asking their employees and other stakeholders for feedback and ideas, only to reject or ignore their suggestions over and again. He uses the term “askhole” to capture this behavior, and many who have experienced work life in this sector will find themselves chuckling in agreement. Basically, you know that one friend who keeps coming crying to you about something, asks you for advice, and so you hit pause on Netflix, listen to them attentively, empathize, and give them reasonable suggestions, and then later you find out that they completely ignored you or did the opposite of what you recommended? That’s an askhole. Or someone who keeps asking for advice until they get an answer they agree with. That’s also an askhole. So here’s the question for you non-profit dwellers: How many town meetings, “open door policies,” online surveys (helloooo, Survey Monkey! ), strategic planning discussions, and coffee hours have you been invited to by senior administrators and perhaps board members? Of these, how many times have your concerns or suggestions been seriously considered, much less acted upon in an inclusive way? Your answers will go a long way toward determining whether you have a healthy or dysfunctional organizational culture. They also will correlate strongly to the overall morale of rank-and-file stakeholders within your organization. Hat tip to Kayhan Irani for the Vu Le article! I just posted to my Social Science Research Network (SSRN) page a draft of a forthcoming law review essay, “Workplace Bullying and the Law: U.S. Legislative Developments 2013-15,” slated to appear later this year in the Employee Rights and Employment Policy Journal, published by the Chicago-Kent College of Law. This short piece is a follow-up to a panel presentation I gave in January at the Annual Meeting of the Association of American Law Schools. In 2014, California and Tennessee enacted statutes covering workplace bullying, making them the first American states to codify laws addressing this form of interpersonal mistreatment at work. These two statutes led a procession of recent legal and policy initiatives concerning workplace bullying in the United States, which also included a vetoed state bill and continued advocacy at the state levels for enactment of comprehensive workplace anti-bullying legislation. This essay, a follow-up to my panel presentation at the 2015 Annual Meeting of the Association of American Law Schools, will discuss significant legislative developments concerning workplace bullying at the state levels, covering 2013 through early 2015. It is the latest in my series of periodic law review commentaries about workplace bullying and American employment law. The essay focuses on four states: It summarizes and analyzes the new California and Tennessee laws. It discusses the merits of a gubernatorial veto of workplace bullying legislation in New Hampshire. Finally, it examines the fortunes of the Healthy Workplace Bill in Massachusetts. This is by no means a comprehensive summary of legislative activity during the past three years, but rather takes a snapshot look at some of the most significant recent developments. You may download pdfs of this piece and my other law review commentaries without charge from my SSRN page. This essay makes a case for organizing and hosting smaller academic conferences, workshops, and symposia that promote genuine dialogue and move at a slower, more contemplative pace. Although the main purpose of an academic gathering is not to create and experience a “feel good” event, smaller scale programs may better facilitate spirited, respectful dialogue, intellectual exchange, and an ethic of fellowship that nurtures connections and friendships. In addition, in offering post-program publication opportunities, we may consider packages of shorter essays as less burdensome alternatives to full-length symposium issues of journals. This essay grew out of the author’s hosting of, and participation in, a small conference on therapeutic jurisprudence at Suffolk University Law School in 2014. 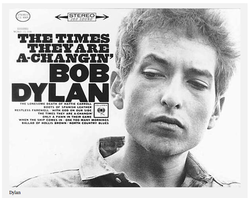 With apologies to Bob Dylan, the times are always a-changin’. But if you buy into the rhetoric of certain practitioners of management-speak, then you’d think that the impetus for change occurs at those magic moments when they happen to be in charge. Under such conditions, an assumed need to change becomes the catch-all justification for virtually any change. We have to change, so let’s change this! And if you oppose the change I want, well, then, you must be AGAINST CHANGE!!!!! Or perhaps a given challenge or problem is used to justify a specific action. Times are tough, so we have to close this department! We’re in a competitive environment, so we have to cut your pay (while raising ours)! So stop opposing change!!! Of course, it’s a logical fallacy that any given set of circumstances necessarily justifies a specific response or action, but organizations get away with it all the time, and a lot of people go along for the ride. After all, on the whole, we are much better at identifying or creating problems than we are at projecting the efficacy of proposed solutions. Unfortunately, the perceived pressure to change, whether self or externally generated, can lead to a lot of bad and hurtful decisions. Okay, I realize these points may sound somewhat abstract to people accustomed to saner work environments. But I’m guessing that if you’ve been in an organizational setting where a lot of lousy decisions are made in the name of change, then you know what I’m talking about. Let’s say you have a Twitter account, and one day, in a flash of supposed brilliance, you think of something clever but offensive and edgy. Your brain’s screening process falls prey to your quick wit, and you decide to Tweet it. Even though you don’t have many followers, somehow your Tweet goes viral. Before you know it, thousands of people you’ve never met are calling you the worst human being on the planet and demanding that you lose your job (or worse). By the time she landed in South Africa, it had gone viral, with the Internet lighting up with cries of indignation and racism. As a result of the outcry, Sacco would soon lose her job, and her reputation would be in tatters. Ronson goes into some detail about Sacco’s experience, sharing parts of several interviews with her. In addition, he provides stories of other individuals who said or allegedly said something that caused offense and rippled at hyper speed through the online world, ultimately imposing a heavy price in terms of careers and reputations. In most cases, the virulent anger fueling the responses directed toward offending Tweet authors far outweighs the purported sin. The stories that Ronson shares in his article are excellent examples. It struck me as eminently fitting that Ronson’s piece is accompanied by the illustration above, showing birds ganging up on one of their own. During the 1980s, the late Swedish psychologist Heinz Leymann used the term “mobbing” to describe the kinds of abusive, hostile behaviors that were being directed at employees by their co-workers. 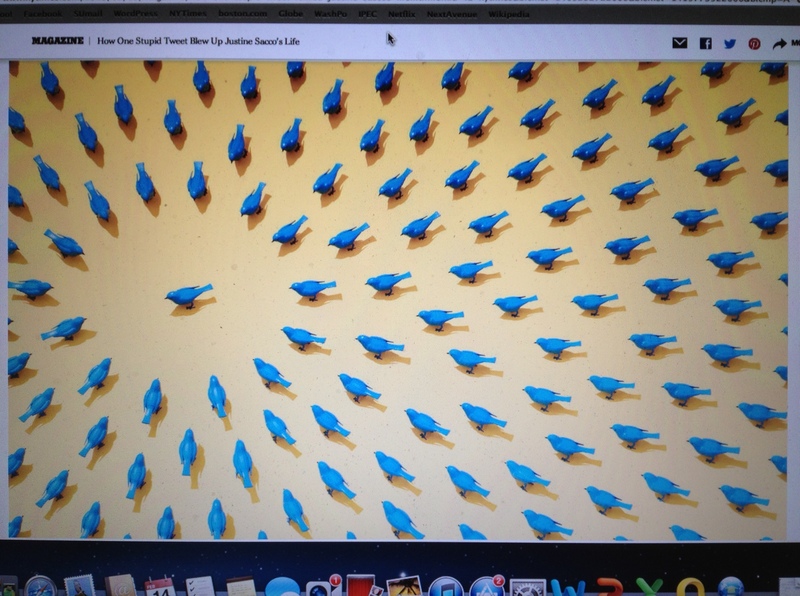 Leymann’s theories were informed by the mobbing behaviors of birds! (Leymann was a pioneer practitioner and theorist in addressing workplace bullying, mobbing, and abuse. You can learn more about his work here.) While the situations Ronson describes are not solely work-related, the mobbing dynamics resonate strongly with Leymann’s work. Of course, virtually any offensive or provocative online utterance these days has some potential to go haywire. As for Twitter specifically, while it is a tremendously useful tool for informational networking, when used as a horn for drawing attention to one’s self or opinions, there’s an instant premium put on sharp, witty, and/or clever turns of the phrase. It’s an easy recipe for getting into trouble with a reckless or thoughtless statement or joke. Misguided Tweets have become one of the leading sources of public apologies, not only for celebrities and famous people, but also in the case of Justine Sacco and others like her, for everyday folks as well. Over the years, many people have suggested to me that I start a Twitter account in order to promote the work I’m doing. My standard reply is that when it comes to social media, blogging and Facebook are just about all I have time for right now. But if I’m being totally honest, I must confess that another reason why I stay off of Twitter is that I don’t trust myself to avoid saying something really, really stupid with it. I fully understand how easy it is to Tweet first, think later. I’m not defending the publication of insensitive, offensive, or hurtful jokes and statements. Nor am I suggesting that those who engage in abusive behaviors should be excused for their actions. But stories of public mobbings in response to relatively minor offending words constitute more evidence that the Internet, and our public discourse in general, have turned into free-for-alls that implicitly permit people to pummel, pillory, and threaten others for their perceived mistakes. These are not the characteristics of a healthy, compassionate society. You may wonder after reading this and Ronson’s article how someone can be so quickly terminated for behavior unrelated or perhaps only tangentially related to work. In America, at least, the rule of at-will employment is the norm, whereby an employer can fire someone for any reason or no reason at all. This rule is grounded in a legal structure called “master and servant” relations, and you can guess who is the master and who is the servant. For more on this, see my 2013 blog post, “Master and servant”: The roots of American employment law.